After dinner at Emeril’s New Orleans Fish House on our final night of the trip, we wandered down the Strip and back toward the Monte Carlo, stopping in at the Cosmopolitan on the way. We were seeking out the Vesper, which, as Drink Spirits mentions, is located in an oasis removed from the buzzing, dinging, flashing, noisy casino floor. A square bar surrounds the central shelves of house-made infusions, bitters, and premium liquor and within which craft mixologists endlessly circle, frequently stopping at the mixing and garnishing station at the rear (out of view in the above photograph) to pick up a drink for the patron at the opposite side. A very cool modular ceiling hovers above blue-white light of the wall-less space. Most patrons opted for the lounge furniture, but we headed, as usual, to the bar. 1 1/2 ounces Russell’s Reserve 6-Year Rye, 1 ounce Amaro Meletti, 1/2 ounce Cinnamon and Fig-infused Vermouth (Cinzano Sweet), 2 dashes Angostura Bitters, and a pinch of cayenne pepper. Garnished with a chocolate-covered “Aztec-spiced” (read: cayenne, coca, cinnamon, sugar) cherry. I was searching for a nightcap, something heavy and deep, slightly bitter, and spicy. How could go wrong with rye, amaro, and spices? This was listed, if I remember correctly, across from the Manhattan. Absolutely perfect! I didn’t get a chance to ask about the Aztec spices, but I did try a sample of their cinnamon-fig vermouth after inquiring as to the brand. “We use Carpano Antica in the Manhattan,” I was told, “but it would go to waste in an infusion, so we use Cinzano.” And no, Matt, you don’t have to pay for half-ounce samples from mixology-minded bartenders: they like curious customers, as I’ve learned after several visits to craft bars. The White Lady (aka Chelsea Sidecar) for Matt. Gin (didn’t catch the brand), fresh lemon juice, and triple sec (likely Cointreau). Lemon twist garnish. Again, perfect! A true classic that I’ve overlooked, this one came out seamlessly balanced and smooth. This is what a sour-style cocktail should be like every time it’s made. I wish I hadn’t overlooked the gin used (my only gripe about the Vesper is that our drinks were made on the other side of the bar, out of sight), but I’m guessing a nice London Dry or Plymouth. Nothing too forward or floral here…maybe Martin Miller’s? In any case, delightful! And reproduce-able! A Perol Necklace for Jack. Bols Genever (! 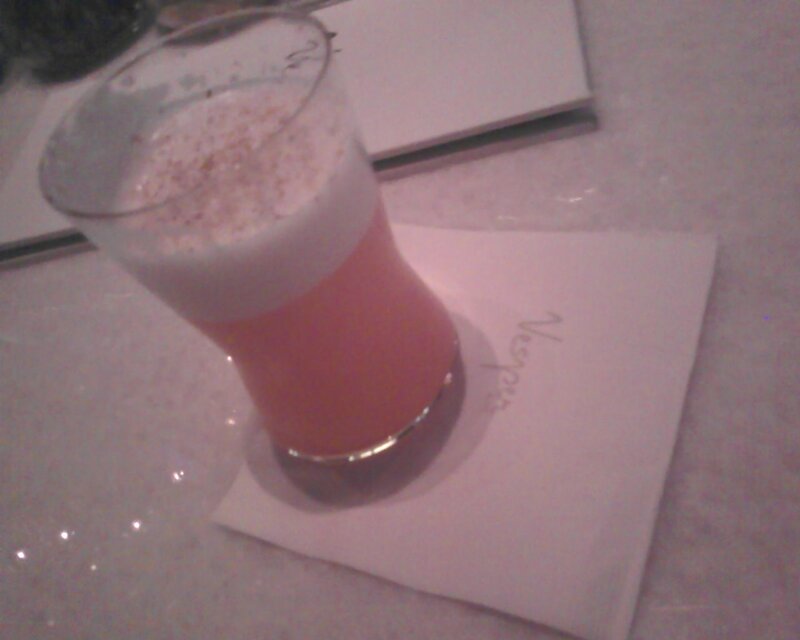 ), Aperol, Blood Orange Juice, Orange Flower Water, Ginger Beer, and possibly egg white…how else would you get that foam on top? Grated nutmeg garnish. I’m a sucker for good drinks named with terrible puns, and wow, is this one intriguing. Nice glassware, by the way! Again, the balance was amazing, and I often forget how well gin and orange play with each other (I rarely have oranges on hand, for some reason, and I’m reluctant to use canned or bottled juices). The ginger beer didn’t seem to have excessive bite. I could probably duplicate this one at home with some trial and error. I explained to Jack that Aperol was what Matt and I sampled at Emeril’s before our meal and that they had overcharged us for it ($12 for an Aperol? Seriously, Vegas? ), but it was put to good use here. 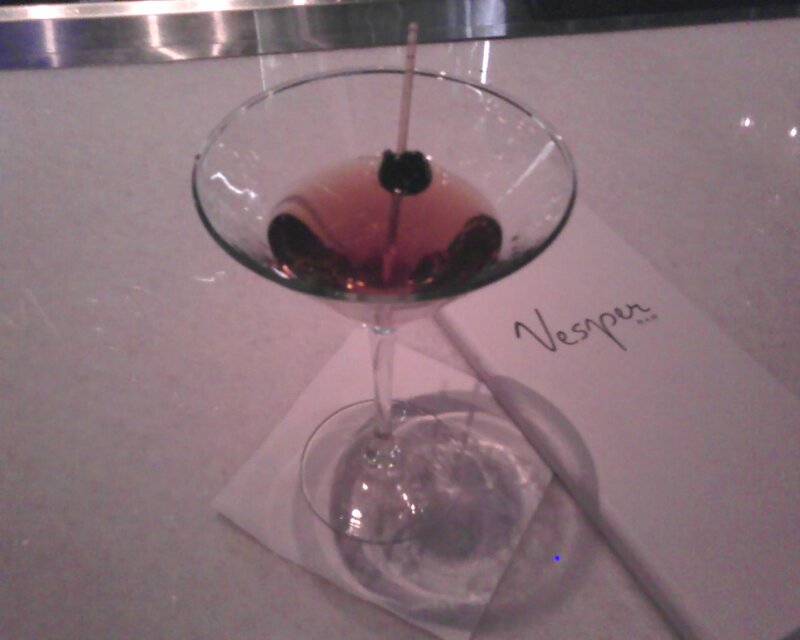 Professional, knowledgeable bartenders, great glassware, fantastic drinks, and a top shelf liquor selection make the Vesper my Vegas bar of choice on the trip. A bit pricey (Vegas!) at $13-14 per drink, but worth every penny. “I think you’ve turned me on to mixed drinks,” Matt said afterward. Who can argue with mixological prowess? 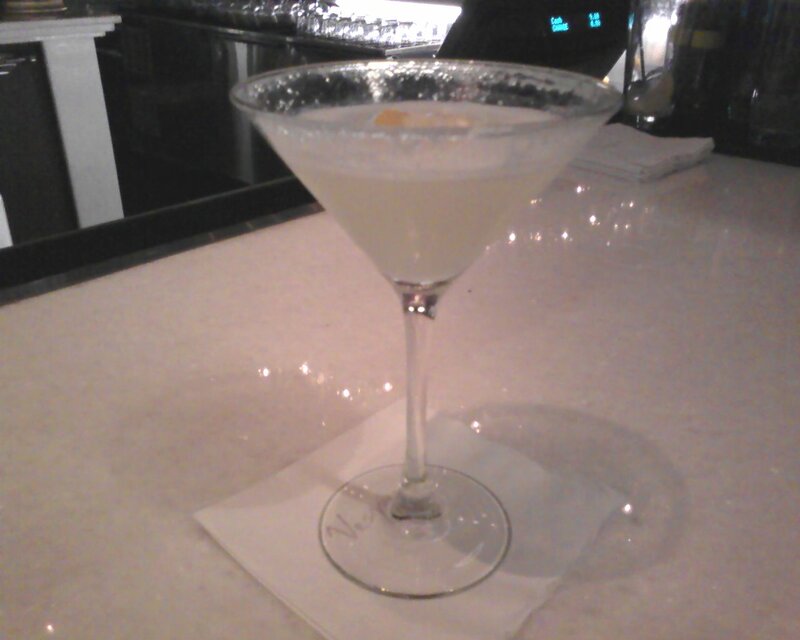 Check out The Minty’s article for a review of her equally satisfying visit to the Vesper. Also take a look at Vegas Seven’s “Cocktail Culture” video to see three of the Cosmopolitan’s bartenders at work, the third (at the 4:00 mark) being the aforementioned Andrew Pollard mixing up The Mayan, this time with Michter’s Rye. Ah, no, I didn’t see it! Looks like wonderful cocktails were had on both occasions. The Vermouth Perucchi is what I’d like to taste…that and the Amer/Lillet/Rye. Sadly, I’ll be left to my own devices, as there is no return trip to Vegas planned in the future. 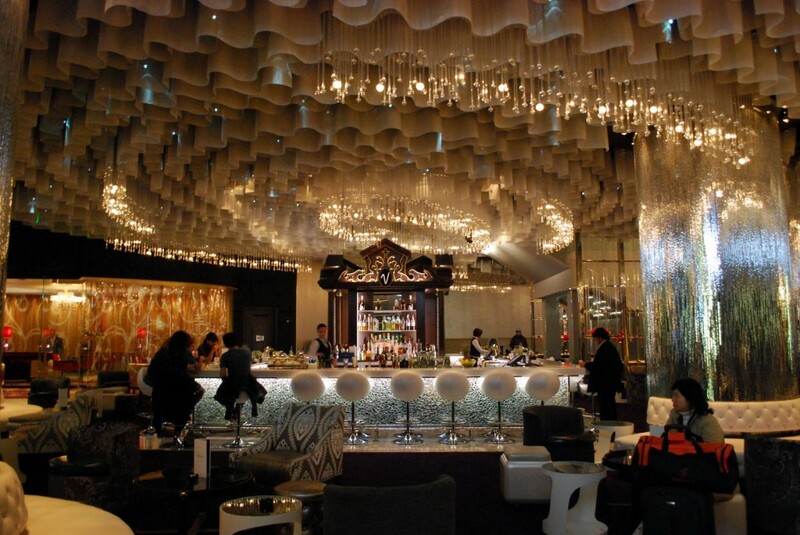 This entry was posted on August 29, 2011 by IJ Lauer in Bar Visit, Las Vegas Bars and tagged a perol necklace, cocktails, cosmopolitan, las vegas, mayan, vesper bar, white lady.